The Lunar Reconnaissance Orbiter (LRO) and Lunar Crater Observation and Sensing Satellite (LCROSS) soon to launch companion spacecraft are the two pathfinding robotic missions specifically designed to reignite the US lunar exploration program. Here, I'll focus on the launch pad and rocket propelling not just the two completely diverse spaceships but also the hopes and dreams of the science and engineering teams who have toiled long and hard at a once in a lifetime chance to shot the moon. While reporting for The Planetary Society from the Kennedy Space Center press center on the brilliantly successful STS-125 mission to completely makeover Hubble, there were also opportunities for first hand exposure to other space exploration missions. A few days after observing the LRO/LCROSS spacecraft stack with mission team members inside the "clean room" at Astrotech, I had the rare privilege of an exciting special visit taking me directly into Launch Complex 41 and to witness with my own eyes the powerful Atlas V/Centaur rocket that will thrust the unique duo skyward. My tour was courtesy of United Launch Alliance (ULA) and my ULA host Mike Rein, NASA and the Kennedy Space Center to whom I am very thankful and also for allowing me to share my experience with you all. aunch Complex 41 at Cape Canaveral Air Force Station, FL during my pad tour on a stormy day in mid May while reporting on the STS-125 Hubble Repair mission. Complex 41 comprises the Vertical Integration Facility (VIF) at left with doors closed, spherical cryogenic liquid oxygen storage tank (465,000 gallons) and Launch Pad at center with four lightning masts. There is no permanent gantry at the pad. 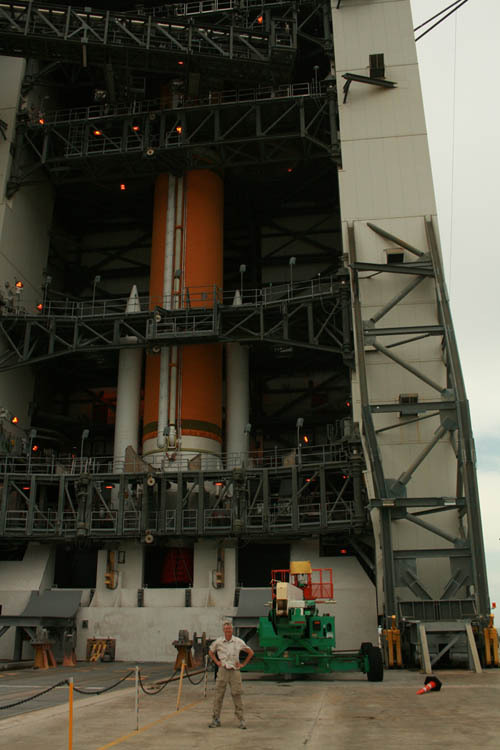 Twin tractors push the Mobile Launch Platform with Atlas V rocket from VIF to launch pad. Beware: The oxygen tank is emblazoned with a big "No Smoking" sign! 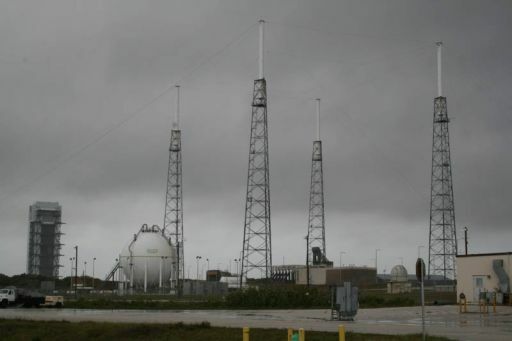 tlas V Launch Complex 41 during my visit in late May as sky momentarily clears. Launch Pad at left with four lightning masts. Atlas V rocket is assembled in the VIF or Vertical Integration Facility at right. All launch vehicle integration and spacecraft processing activities are carried out in the VIF. There is no access to the spacecraft at the launch pad. he Atlas launch pad and facilities are located at Cape Canaveral Air Force Station (CCAFS), adjacent to the Kennedy Space Center and the twin Space Shuttle launch pads 39 A and 39 B. CCAFS is one of NASA's primary launch sites along with Vandenberg Air Force Base in California. CCAFS, being a military base, is a restricted access area not open to the general public due to security and safety concerns. Launch Complex 41 is surrounded by a further perimeter security fence with guards and there is no entrance without the special access badges, credentials and permits required of me and all visitors. The Atlas V rocket is part of the NASA Launch Services Program at the Kennedy Space Center for the purchase of Expendable Launch Vehicles (ELV). Charles Tatro, the NASA Launch Services Program Mission Manager at KSC explained to me that, "The Launch Service Program (LSP) procures Launch Services for NASA scientific and robotic exploration missions using their firm fixed-price contract. The launch service is selected through a competitive acquisition process that provides the best value in launch services to meet the Government's requirements. NASA HQ authorizes LSP to acquire these launch services approximately 3 years prior to the launch date". After gaining entrance through the air force security gate, I arrived with my host Mike Rein at the rear of the 30 story Vertical Integration Facility (VIF) to stand just centimeters away from the erected and awesome Atlas V/Centaur rocket. The rust colored Atlas V first stage was sitting on top of the Mobile Launch Platform (MLP) and residing inside the VIF. A few days prior to my pad visit, the rocket had been rolled back into the VIF after completing a countdown wet dress rehearsal demonstration test during which the booster was fully loaded with propellants including liquid hydrogen, liquid oxygen, and RP-1 fuel. 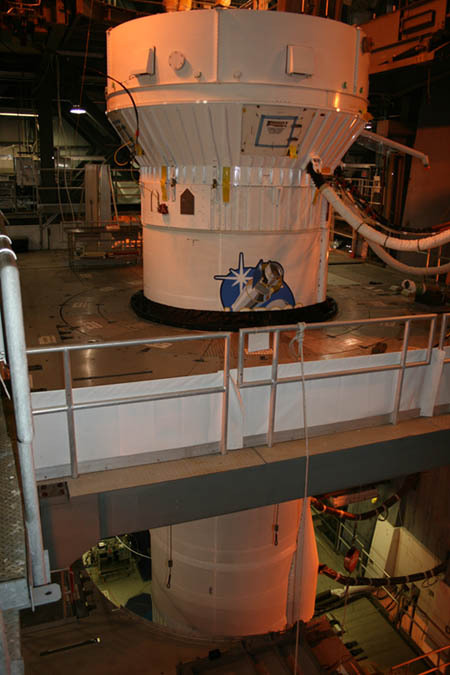 The Atlas V booster and Centaur stage had been assembled and stacked inside the VIF in late April 2009. The booster houses two engine bells attached at the base of the first stage Common Core Booster. They are inscribed in Cyrillic because the rocket engine is built in Russia. 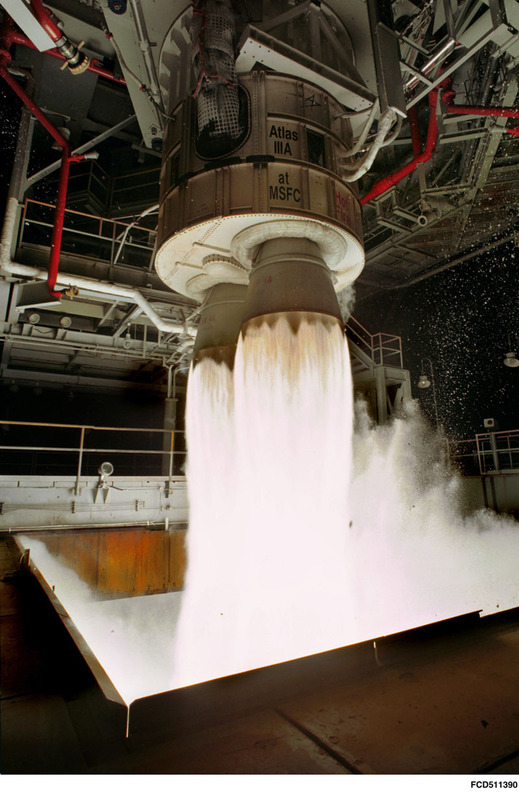 The Atlas V first stage is powered by a dual chamber, dual nozzle nearly 1 million lb. thrust RD-180 Russian rocket engine. The RD-180 is Russian developed and produced hardware manufactured in the Energomash rocket plant. Below is a picture of an RD-180 engine test which I obtained with special permission from Pratt & Whitney and United Launch Alliance especially for this article for The Planetary Society and another upcoming in Spaceflight magazine. For commercial proprietary reasons I could not take a picture of the RD-180 engine itself but everything else was completely open to imaging. est firing of the dual chamber, dual nozzle RD-180 rocket engine, developed and built in Russia and inscribed in Cyrillic. Special reprint permission for The Planetary Society courtesy of Pratt & Whitney Rocketdyne. he Atlas V is the newest member of the Atlas rocket family since first launched in 2002. The LRO/LCROSS mission will mark the sixteenth Atlas V launch .The RD-180 rocket engine has been certified for use in several versions of the Atlas rocket. The Atlas V rocket and fairing stand approximately 189 feet tall. The RD-180 is ignited at T minus 2.7 seconds to initiate the launch sequence and liftoff occurs at T plus 1.1 seconds after confirmation of healthy engine performance. We next took the VIF elevator up to the 4th level where I viewed much of the Centaur upper stage while walking most of the way around. Another few floors up brought us to the top of the Centaur stage, decaled with the beautiful blue and white LCROSS logo, but minus the payload stage on this particular day. The two spacecraft, encapsulated in the payload fairing, would be bolted on top a week and a half later. y visit inside the Atlas V gantry known as the Vertical Integration Facility (VIF). Pictured here are several access floors revealing the top of the Centaur upper stage onto which the LRO and LCROSS stack will be bolted. Note the LCROSS decal painted on Centaur skin surrounded by upper floor grating. Umbilical lines at top right actively convey power and nitrogen purge. tacked Centaur upper stage atop Atlas booster inside the VIF at Complex 41. The single engine Centaur is 10 ft in diameter and 41.5 ft long. This Centaur will propel NASA's LRO and LCROSS robotic pathfinders to Earth's moon in search of lunar water. 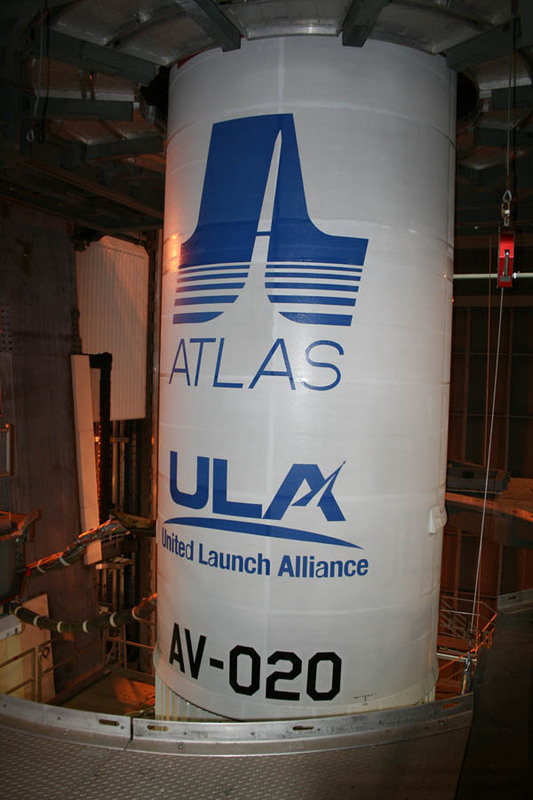 This Atlas rocket for LRO is designated as tail number AV-020. he rocket was powered on as I stood nearby behind a railing. Umbilical lines were connected to the Centaur carrying electrical power and a nitrogen gas purge to the rocket. From the railing I could look directly down many stories in the cavernous open space to see the lower half of the Centaur and a large portion of the first stage booster. This is not a view recommended for those who are understandably squeamish of heights. But it sure was quite thrilling for me! At rollout, the VIF doors are opened and two powerful tractors named "trackmobiles" push the Atlas rocket about 1800 ft on a rail system to Launch Pad 41. The launch pad is surrounded by 4 lightning masts. "The process takes about a half hour on the day before a launch", said Mike Rein. The VIF doors were closed on the day of my visit due to the same prevailing heavy rain and strong Florida wind gusts which delayed STS-125 from returning to KSC and nearly prevented my tour inside Launch Complex 41. The three to four hour Atlas countdown starts the following day after rollout. Since no humans are on board, countdowns for unmannned expendable rockets like the Atlas and Delta are much shorter and simpler. Nothing like the complexity of a Space Shuttle launch, said Mike Rein. Still, every parameter must be perfect or it's "NO GO". Hundreds of millions of dollars, if not more, are at stake. We then drove several miles down the road to the Atlas Space Operations Center (ASOC). The booster components are initially received and housed at the ASOC for viewing, inspection and testing. The Atlas Launch Control Center is located inside ASOC. Upon admittance to the ASOC, I saw an entire Atlas 5 rocket minus the payload and fairing resting horizontally in three pieces: 1st stage, Interstage Adapter (ISA) and Centaur (see photo). The Centaur and ISA were wrapped in plastic sheeting and yellow colored protective shipping rings for stabilization and protection. "ULA generally prefers to receive the booster components as little as 2 months prior to a scheduled launch", says Mike Rein. am standing inside the Atlas Space Operations Center (ASOC) hanger and simultaneously observing all major components of an entire Atlas 5 rocket except the payload and fairing. 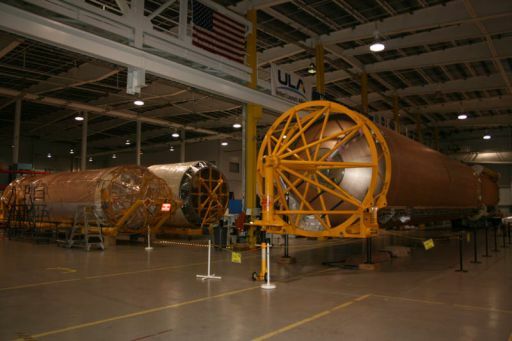 Three pieces shown here (left to right) are the Centaur upper stage, Interstage Adapter (ISA) and 1st stage booster with protective shipping rings. y launch pad journey that day next took me to the nearby Delta 4 Launch Complex 37, which we'll see more of another day. en Kremer visits Delta 4 rocket at Cape Canaveral Air Force Station. This medium lift version of the Delta 4 with two solid rocket boosters is set to loft the Geostationary Operational Environmental Satellite (GOES-O) on June 26, 2009.
n May 28 when the stormy Florida weather briefly relented, the LRO & LCROSS spacecraft stack encased inside the decaled payload fairing were at last transported from Astrotech to Launch Complex 41 at Cape Canaveral Air Force Station. The stack was then moved inside the mobile service tower (VIF), carefully hoisted upwards about 13 stories and bolted atop and mated to the Centaur upper stage of the Atlas V booster. After mating, an integrated systems test between the LRO/LCROSS spacecraft and the Atlas V was successfully conducted on June 1. An integrated launch vehicle/spacecraft telemetry test on June 2 verified the state of health of LRO/LCROSS. The vehicles passed the Flight Readiness Review (FRR) on June 10 with no major issues or concerns to hamper launch at this time. Spacecraft closeouts were accomplished. A high fidelity countdown dress rehearsal was conducted by the launch team on June 11. ULA is the commercial provider that builds and launches the Atlas and Delta vehicles with state of the art facilities. ULA and assorted other rocket teams have launched 5 decade's worth of space science exploration missions so beloved to the readers of The Planetary Society Weblog and legions of space and astronomy enthusiasts worldwide. 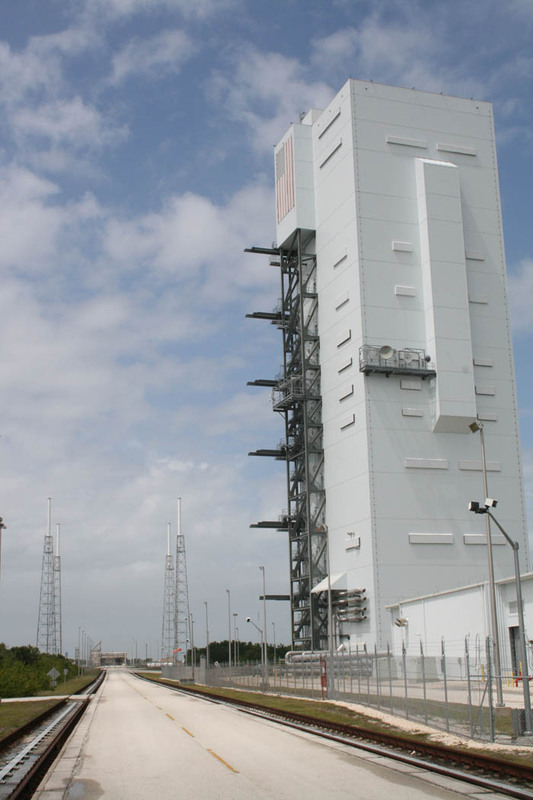 The Atlas V vehicle and spacecraft will be rolled out to Pad 41 on June 16. Launch is set for June 17, with three one second launch attempt windows of 3:51, 4:01 and 4:11 p.m. EDT. If the launch scrubs, the next launch attempt is set for June 18 with three launch attempt windows of 5:12, 5:22 and 5:32 p.m. EDT. Most launches are not classified and the public may watch any CCAFS launch from nearby areas and beaches which are not part of the Air Force base. Check out my earlier reports: LRO & LCROSS Up-Close Tour and LRO & LCROSS Up Close Tour: Part 2, Hunting for Lunar Water. Planetary Society volunteer Ken Kremer is reporting for us from the Kennedy Space Center, where he is covering the upcoming launch of NASA's Lunar Reconnaissance Orbiter. Kremer is a research scientist and freelance journalist who spends his spare time giving public outreach presentations on behalf of The Planetary Society as a volunteer and NASA's Jet Propulsion Laboratory as a Solar System Ambassador. He also enjoys creating Mars mosaics. Thanks Ken!